This is the first post in our new Renewable Energy series, where we will give the ins and outs of renewable energy that is able to be used throughout residential and commercial spaces. There are three types of solar: PV, Thermal and Hybrid. The PV stands for photovoltaics. These systems convert sunlight into electricity – that doesn’t mean that it needs to be a hot summers day, though, the photovoltaic cells can still generate electricity on your average British day. Thermal does as the name states, it uses the sun’s energy to generate thermal energy, which can be used to heat water or other fluids, but can also be used to power solar cooling systems. Hybrid is the newest of the three, which is a combination of the previous two. These systems bring together advantages of both PV and Thermal, boasting the convenience of a grid connected system, with the battery backup. Part 1, will focus on Solar PV. 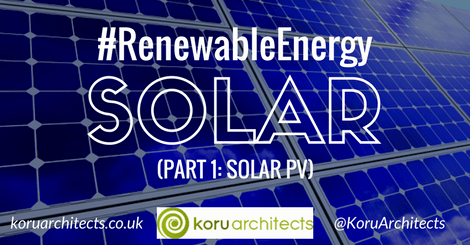 Keep posted for the following parts of our Solar instalment to this series, to read our guide to Thermal and Hybrid Solar Energy. There’s not an overly-simple way to phrase the science behind solar panels. But in its most basic form, a solar panel works by allowing photons, or particles of light, to knock electrons free from atoms, generating a flow of electricity. The power is measured in kilowatts peak (kWp), which stands for peak power and is also referred to as nominal power. In relation to it measuring the peak power, this means that it measures the rate at which is generates energy/electricity at its peak, in full sunlight during the summertime. Solar panels have become increasingly popular over the past decade and most systems are made up of panels that fit on top of an existing roof, but you can also fit solar tiles. How much carbon goes into producing it? What does worry people, is where these systems are made and the production that goes into them. Today, nearly half of the world’s photovoltaics are manufactured in China, who contributed around 30% of the world’s CO2 emissions. That’s the worry – is the production of these systems adding to that? How is it beneficial and how beneficial is it? The sun doesn’t cost you a penny, so after you begin to put the solar panels to use, you will start to see an impact on the bills that you’re paying. Why wouldn’t you want to reduce your carbon footprint? The Feed-in Tariff Scheme will pay you for the electricity that you generate, even if you use it. As well as producing electricity that you can use yourself around your house, you will also receive payment for the electricity you export through the Feed-in Tariff Scheme. The efficiency of solar panels are measured by their own performance, which is more subjective than objective – but of course, a rough estimate can be given as to how efficient you may be able to be. The higher the percentage, the more you will get from your panels; a higher efficiency panel converts more sunlight into electricity using the same or less surface. Solar panels should deliver between 15-22% efficiency. The cost of solar panels is coming down, it has reduced by 70% in the past few years due to the technology maturing and mass market production. Most residential solar systems are between 1kW and 4kW – the chart below, from the Eco Experts, shows the plummeting costs of a 4kW solar system over the last few years. How long does it take to payback? In the UK, a PV system, under normal conditions over its lifetime, produce many times more energy than was required from its production. Around 10 years ago, a study found that the payback time for PV panels was estimated 3.5 years in the California sun. Obviously, the UK is different – it was estimated it would take around 7 years. Want more articles like this? Subscribe to our monthly newsletter here.